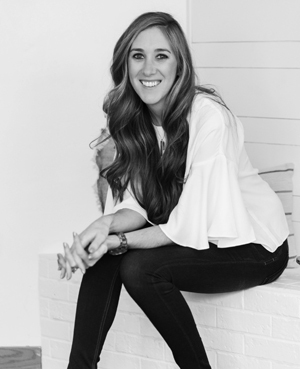 Make sure you stop by and visit all these fabulous blogs and get inspired! 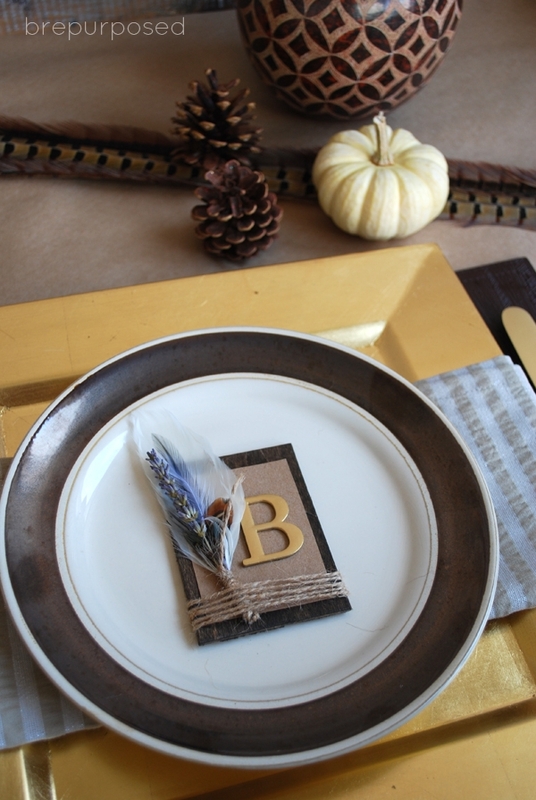 Here are the supplies you need to make this Rustic Place Setting! First you want to stain your piece of wood. 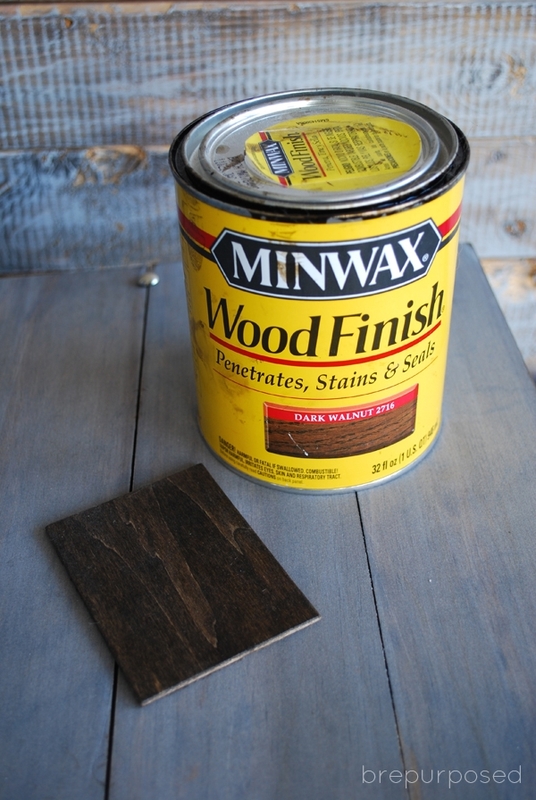 I used Minwax’s Dark Walnut. I didn’t bother sealing it since the majority of it was going to be covered with paper anyway. 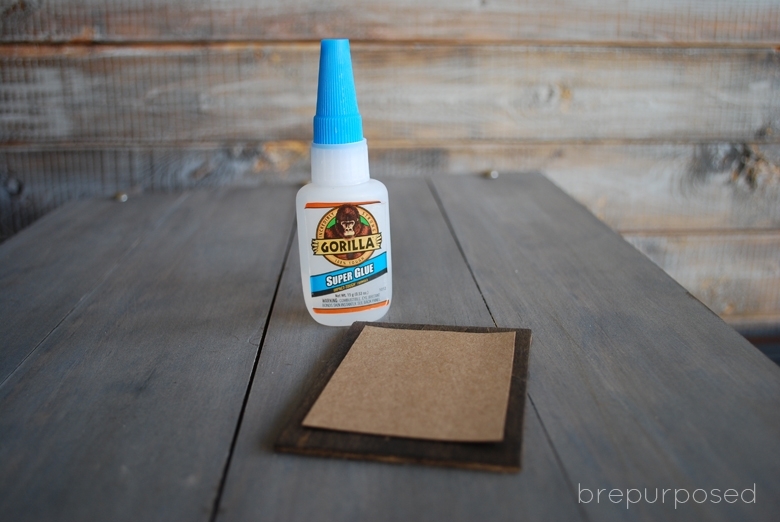 Glue your letter onto the kraft paper. I placed mine a little to the right so there was room for the feather and lavender. 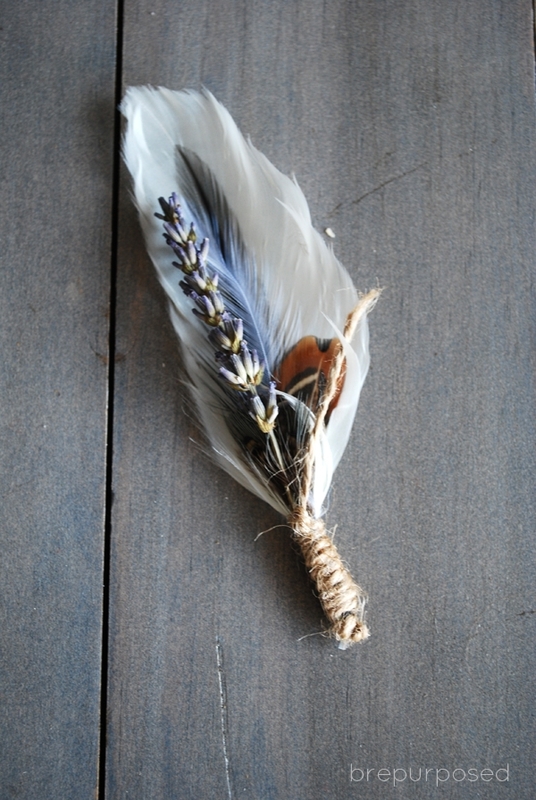 Now take your feather and lavender and wrap some twine around the bottom to hold them together. Place this on your wood where you want it to be and wrap the twine around a few times to secure it in place. Don’t forget to visit all the other links too! 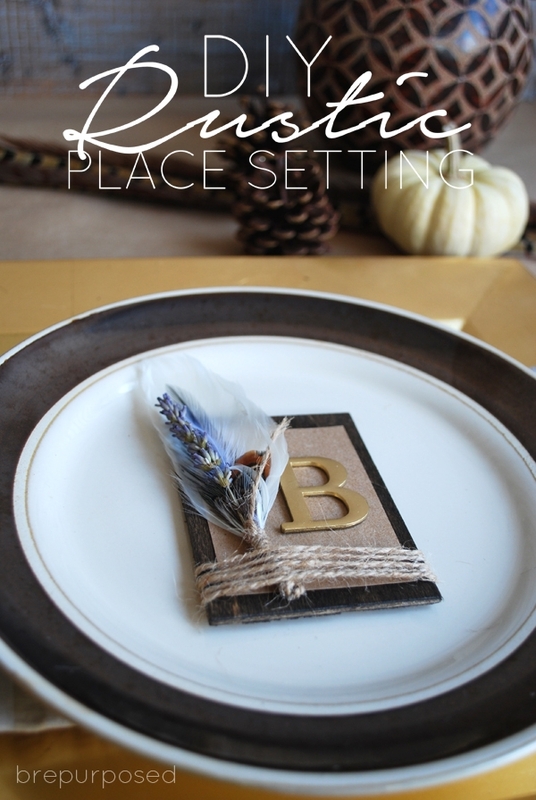 There are so many amazing projects to give you ideas for your Thanksgiving table. Hi Bre! 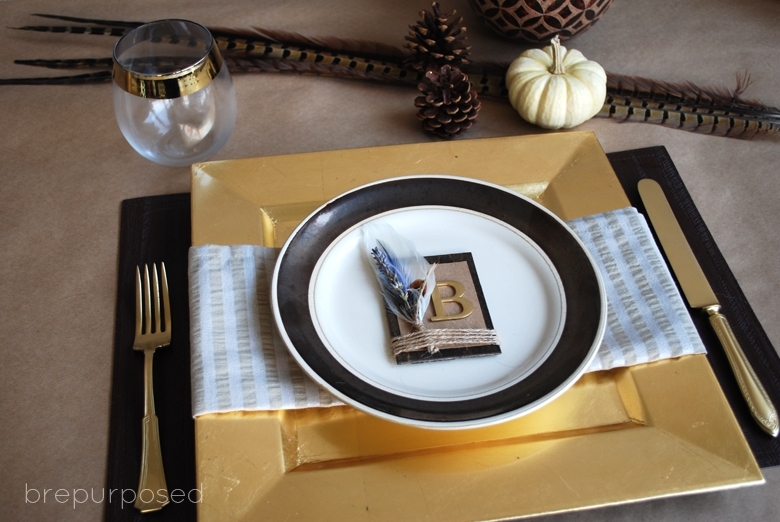 Love this post, and your table setting is gorgeous! 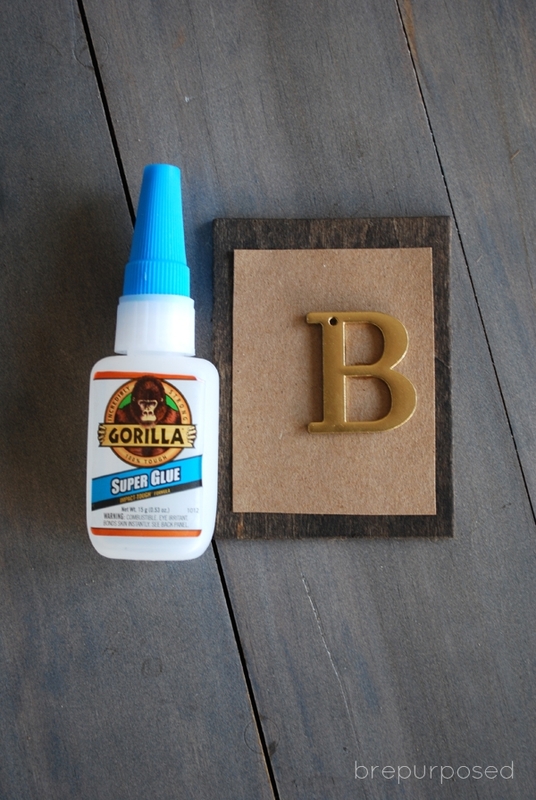 This project was featured over at ourReLoved Fridays! Thanks for linking up! I hope to see you again at this weeks party! 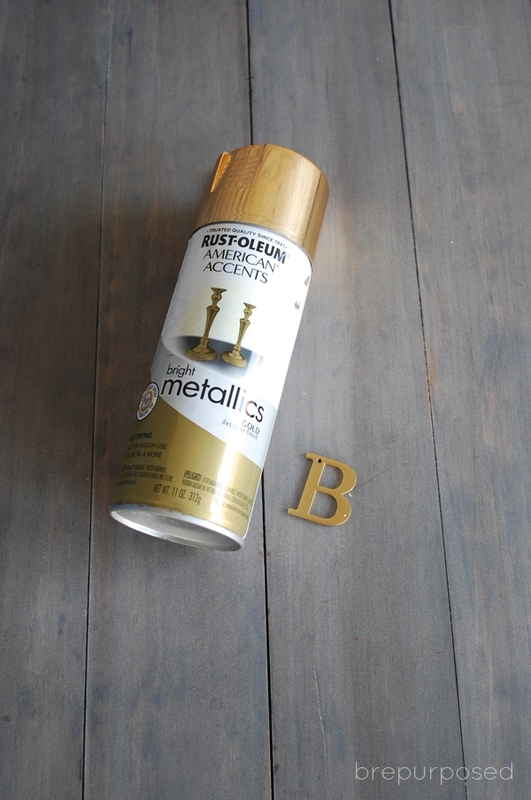 I have *got* to get some of that gold spray paint! Fabulous tablescape! Bre this is SO creative! I love that little lavender feather arrangement you put together- not a combo I would’ve thought of myself! Thanks for sharing your post at the Say G’Day linky party. I’ve just pinned this to the Say G’Day Saturday board. I don’t know where you find the energy to keep creating fabulous goodies each week! I saw this on a few sites and I keep coming back to the link! Love it so much!! Especially the feathers and lavender together – so unique! Bre, this is so completely lovely! Please reserve me a seat at your Thanksgiving table! Featuring on this weeks Be. YOU. tiful link party ! haha you’re more than welcome to come 😉 Thanks so much or the feature, Adrienne! Bre these are so beautiful. These rustic place settings would make any guest feel extra special. Thank you for linking up to On Display Thursday. So lovely! Stop by House on the Way tonight at 8pm and see it featured at the Twirl & Take a Bow Party! Have a great week. Thank you so very much, Leslie!! The feather is the perfect touch for this idea. You are incredibly talented, Bre. I always enjoy seeing the fabulous things you create. Aw thank you so much, Jamie! You are too kind 🙂 Have a great weekend! I should have brought a beverage, I think I’m going to be here for a while. So much inspiration! This put a big smile on my face 🙂 Thank you for stopping by and hopefully staying for a while! Beautiful…you always have such great ideas. Thanks for sharing with the Thursday Blog Hop. I LOVE LOVE LOVE IT! 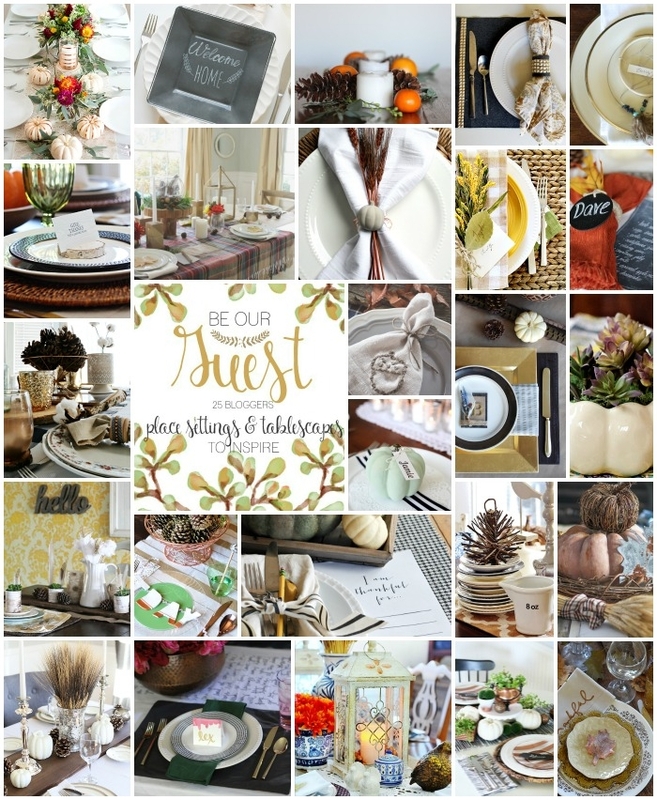 I have a Pinterest board dedicated to Thanksgiving table settings and this is a great idea. I will def pin it! 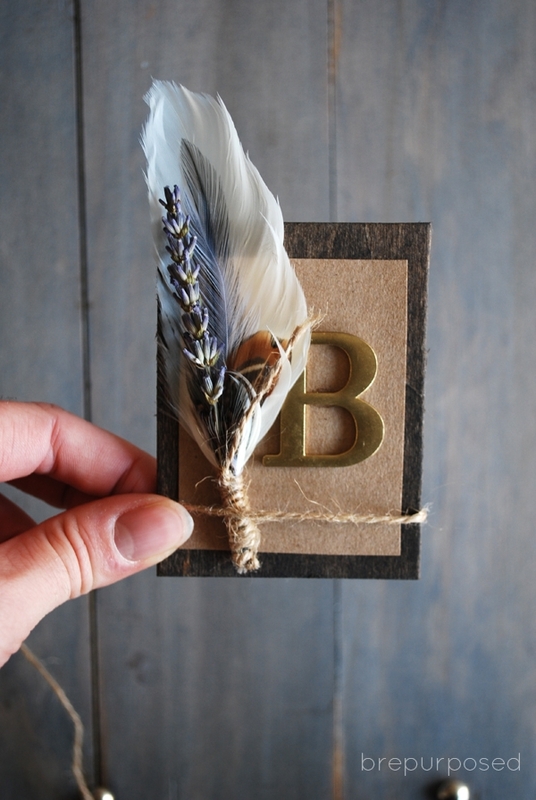 Loving the little feather/lavender combo, I would want to wear it as a brooch afterwards! Absoutely gorgeous! I love the feathers and lavender sprig. Dried lavender and dried hydrangeas are some of my favorite additions for fall. Thanks for sharing and linking up at On Display Thursday! What an adorable place setting! I’d like to incorporate this look for my Thanksgiving day table. Thanks for sharing and for joining us for Celebrate Southern link up this week! This is such a wonderful place setting! It is definitely great, and inspiring for this time of year! We are hosting thanksgiving at our house this year… I will have to get planning to do something like this! Thanks for joining the Celebrate Southern linkup again! I’m pinning this post! Cheers! Thank you so much Susan! How fun that you’re hosting 🙂 This was such an easy project to make. Thanks for pinning! I’m stopping by from the Outside the Box party. This idea is so lovely and unique!! It immediately caught my eye! Very pretty! The perfect balance of casual and put-together. Beautiful Bre! Love the feathers! I love those feathers! Where did you find them? beautiful, bre! i love the touches of gold with the gold chargers- looks awesome! This is seriously so creative and nice. I love it. This is such a cute idea! Will try it next time I have guests over. This is so adorable! I wish I hosted parties so I would have a reason to make these! It’s ok I don’t host parties either haha, you can totally just make one for yourself! So pretty Bre! And I am loving the feathers right now! Thanks Jenn! Me too, I can’t get enough! It is beautiful Bre! Love the stained wood, the feather… love rustic and this is gorgeous! Wow, thank you so much! I appreciate that 🙂 I got the wood slices and letter from Hobby Lobby. Have a wonderful week! Delightful! I wish I had your creative eye! So beautiful! 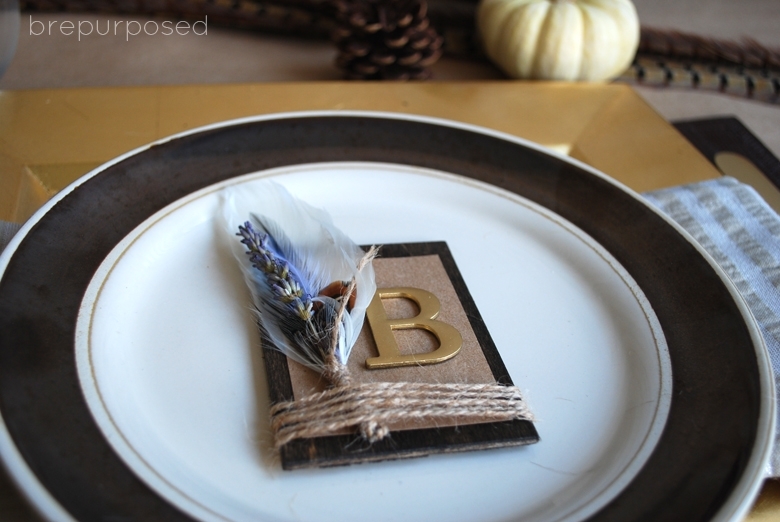 I am hosting Thanksgiving and I might make these as my place cards! So pretty, Bre! I love the mix of rustic and glam! Beautiful job! This is adorable! Makes me wish I was hosting Thanksgiving!! This looks stunning! Would make a beautiful Thanksgiving place setting. 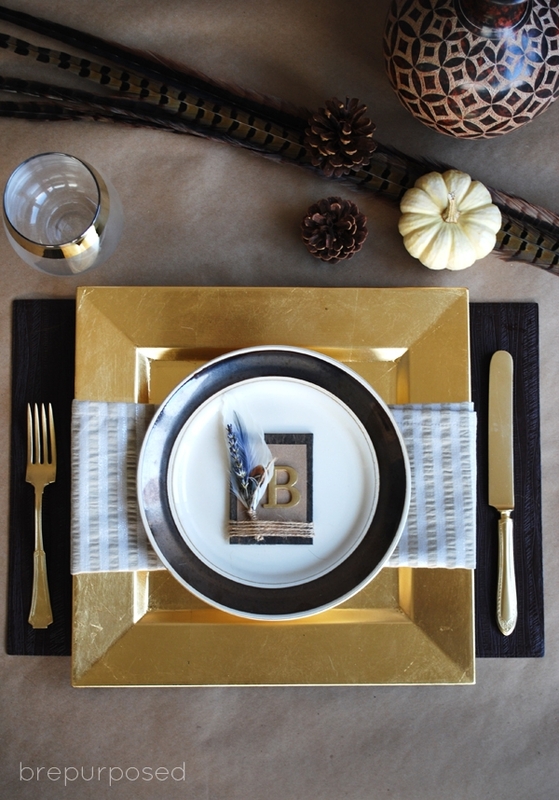 Love all of the place settings, but you really rocked it with the feather and touch of gold! So simple, yet elegant! 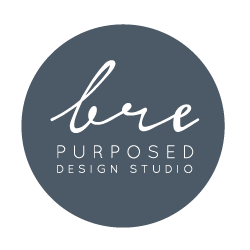 I absolutely adore this project, Bre!! The wood, feathers, stain — PERFECTION!! So clever, Bre! LOVE the gold and we are obsessed with the feather trend right now. Cute cute!! gorgeous Bre! What a great job! Such an elegant setting. Love it. Thanks Danielle! You totally should! Aw man I love it – I want to do something like this for Thanksgiving! So lovely, Bre! 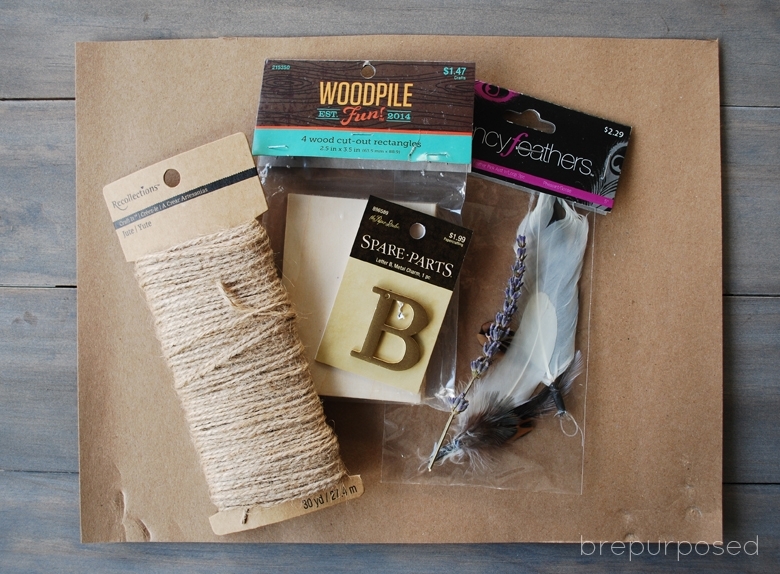 And an awesome DIY, love that feather wrap! Love it Bre! The gold and the feathers are the perfect fall touch!!! Perfect my friend! LOVE how you put those feathers to work! Loving the gold with the rustic! What a great combination! So happy to be partying with you today!